According to the National Interagency Fire Center (NIFC), military personnel mobilized to serve as firefighters to assist with wildfire suppression efforts. Currently, more than 80 large wildfires are burning on about 1.4 million acres in California, Colorado, Idaho, Montana, Nevada, Oregon, Utah, Washington, and Wyoming with nearly 28,000 firefighters and support personnel working on them. The National Preparedness Level is currently at 5, the highest level, indicating a high level of wildfire activity and a high level of commitment of wildfire suppression assets (i.e. firefighters, aircraft, and engines) to wildfires. Weather and fuel conditions are predicted to continue to be conducive to wildfire ignitions and spread in most of the western U.S. through September and in parts of the Northern Rockies and California through October. The Routt County Office of Emergency Management reported the current fire danger in Routt County as moderate. The public is urged to remain cautious and continue fire safety practices when working or recreating on public and private lands. Major growth of the fire in the past several days is to the east, moving toward the Continental Divide and Mount Zirkel Wilderness. Pockets of unburned fuels in the interior of the fire also continue to burn. 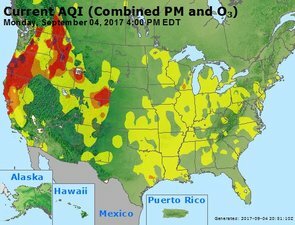 Air quality around the country is being affected by more than 80 wildfires that are currently burning. The map below identifies which regions are most affected.